4 Magic PRO 100 is the only countertop gelato-ice cream storage and display case specifically designed for restaurants, caterers, coffee shops, and gourmet shops. Store your fresh ice cream, gelato, frozen yoghurt and sorbets at the ideal temperature for quick dispensing and serving. 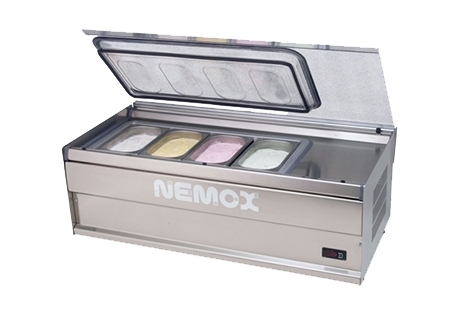 4 Magic PRO 100 can be combined with any Nemox Professional countertop gelato-ice cream machine to create the Nemox Gelato Shop System. In only a small space, you can now prepare ice cream, gelato and sorbets; store it; and serve it - like the fanciest ice cream shops!